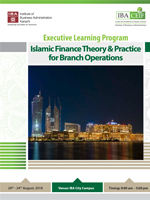 IBA Centre for Excellence in Islamic Finance (IBA-CEIF) is pleased to offer an intermediate level, 5-day certification course to provide an understanding of Islamic Finance and its application in branch operations. The program aims to provide a comprehensive orientation/exposure about various aspects of Islamic banking operations, Shariah compliant products and pool management and SBP regulatory framework. The participants will discuss various practical scenarios with the help of case studies to build a thorough foundation for a quick head start in their career in Islamic Banking.